Though some at Yahoo concede that the company’s remote work culture has gone badly wrong and needed to be fixed, Marissa Mayer’s decision to end the practice by June isn’t going over well elsewhere.She’s facing some particularly vocal criticism on parenting and “mummy” blogs for not understanding the plight of the working mother, despite being the first woman to become CEO of a Fortune 500 company while pregnant. …. So, you may be able to please Wall Street with your decision to completely axe all flexible work arrangements, but I believe you just pissed off and weeded out a very talented pool of current and future employees who I hope are able to find work with more forward thinking companies. I knew from the moment the then-pregnant Mayer parked her Louboutins beneath the grand desk in the corner office of her Fortune 500 company, vowing to take only a short working maternity leave with her firstborn, that your girl would not and had no plans whatsoever to help the American workforce pave the way for a newer, more modern employment paradigm for working mothers. …. Dare I say that for a company trying desperately to innovate, Mayer’s ordering workers back to work seems neither progressive, inspiring or smart. … I know this much: rolling out of the bed, grabbing my computer and getting right to work without worrying about getting dressed, commuting and shooing nosy co-workers out of my office while I tried to get my work done was a godsend on the few occasions that I got to telecommute when I actually worked in an office. And having a boss that understood the dilemmas that come with sick children or a babysitter who didn’t show up to work or school closings and who trusted me to get my job done just made me more loyal—made me work harder to prove that she didn’t get it wrong by letting her foot up off my neck and allowing me to be both a dedicated employee and mum. I had high hopes that a young, female CEO — one who was openly pregnant when she signed on for the job — would bring a fresh perspective and some more, well, trailblazing. This move seems completely out of touch with the modern workplace — one, I might add, that makes no bones of invading almost every second of life via blackberries, laptops and cell phones. Worse, it is totally out of touch with the very stretched lives of the vast majority of working parents who don’t have the benefit of a $300 million cash cushion and all of the work-life support that kind of money can buy. Her decree, uttered with all the certainty that an empress can have from her ivory citadel, was that no longer could Yahoo employees work remotely (aka from home, or anywhere else that’s not the office) anymore. This proclamation assumes that Marissa Mayer is living in the real world today (which she is not); that Yahoo is a relevant company (it is not), and confirms that Yahoo, a technology company follows a construct of the working world straight out of the Mad Men era. Way to join the 21st century Yahoo. Not. All of this is just plain wrong, not just for women but for PARENTS. As a past manager of a team and currently a consultant who works off site and hires subcontractors who work offsite, I am appalled. I’m not appalled at the so-called lazy employees. I’m appalled at the complete lack of management skills at Yahoo. If you can’t tell whether your employees are productive or not if they aren’t sitting in a cubicle a few feet away from you, that says a lot about your lacking managerial skills. Apparently, to Ms. Mayer, I’m more valuable when I’m sitting in my car for two or more hours each day than I could be if I used that time to either work or to do other things that make me a more productive employee (like relaxing, exercising or preparing healthy food). … Maybe it’s just me, but a technology company that insists collaboration can only happen in person is an obsolete technology company. 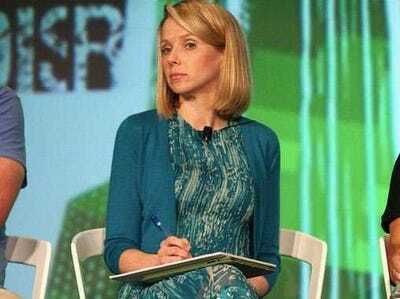 marissa mayer warroom-us working from home working mothers yahoo!